Strictly speaking, a cave is a horizontal passage through limestone: formed where water penetrates a joint or bedding plane and slowly enlarges it over time. The edge of a limestone escarpment exposed to overlying impermeable slopes is a textbook example of cave-forming terrain. Potholes, on the other hand, are vertical shafts that may plunge suddenly and dramatically. 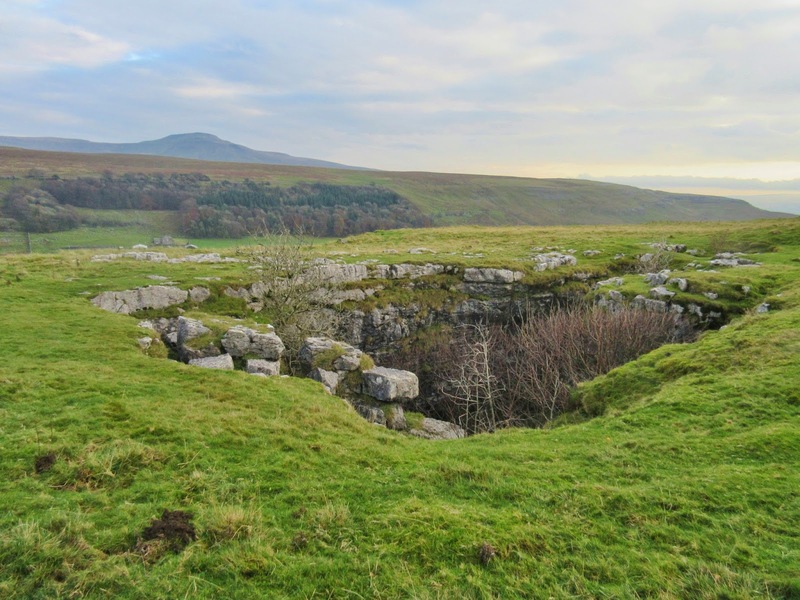 Around Ingleborough, many of the major underground systems are a mixture of the two: open shafts generally plunging to depth, where cave passages lead off, before typically dropping again to the level of the valley floor. 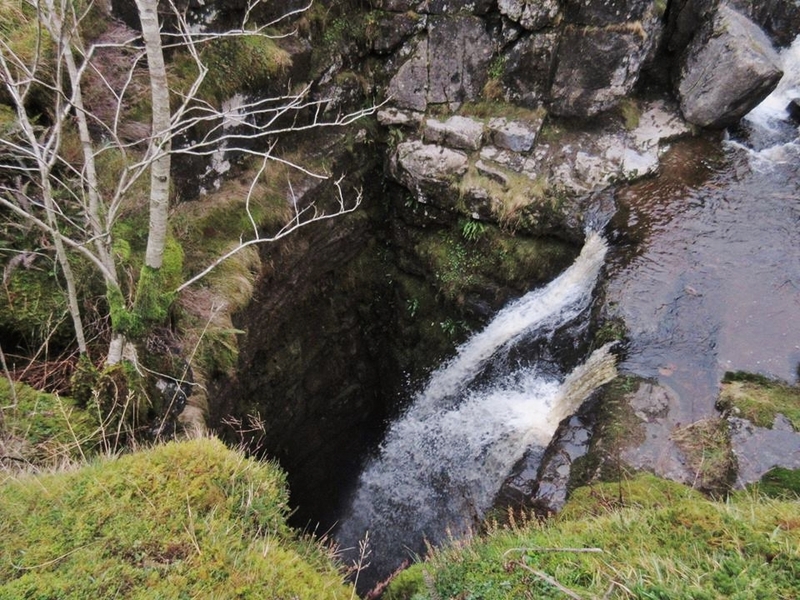 Meregill Hole and Juniper Gulf are typical examples. The shafts may be active – carrying large streams – or they may be long since abandoned, many of them believed to have been formed by glacial meltwaters. Faulting plays an important part in pothole formation, and most of the larger shafts have developed around faults. The wrenching and grinding alters the underlying rock strata, widening the joints and providing convenient places for the mildly acidic water to exploit. 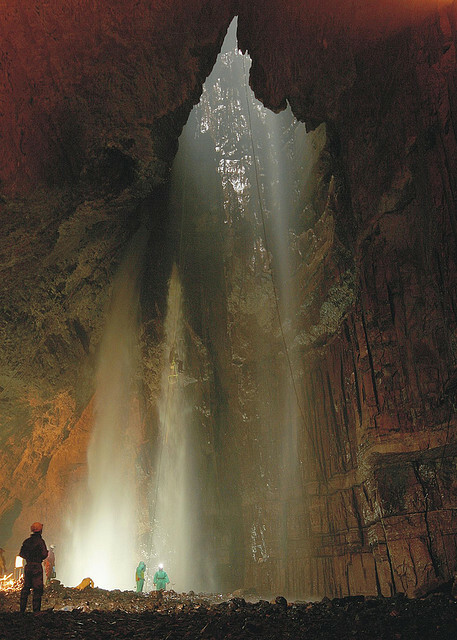 The water may work its way downwards, eroding through many shale layers and beddings, until meeting more resistant rock – prompting it to take an easier option along joints and bedding planes to form connecting cave passages. The great shafts may also be widened by collapse, where rock layers close to the line of the fault typically peel off and fall to the floor below. 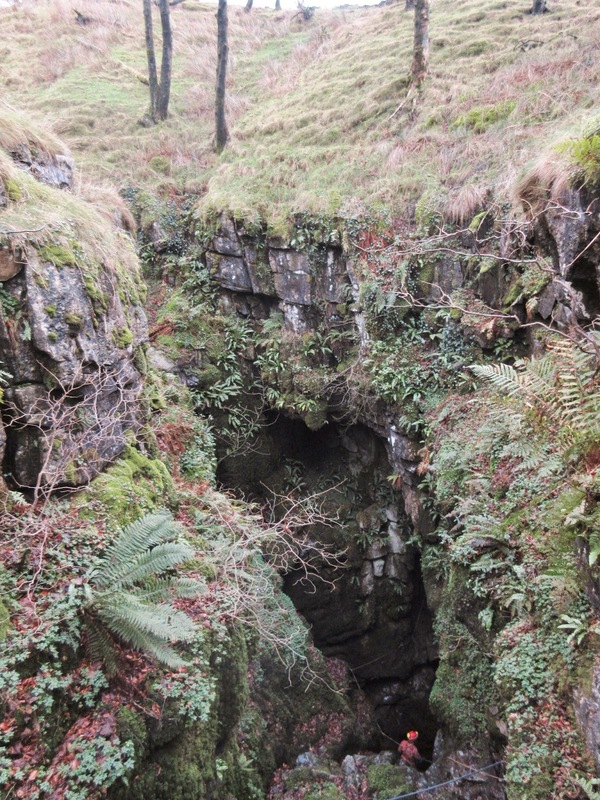 The Main Chamber of Gaping Gill is a fine example of this. 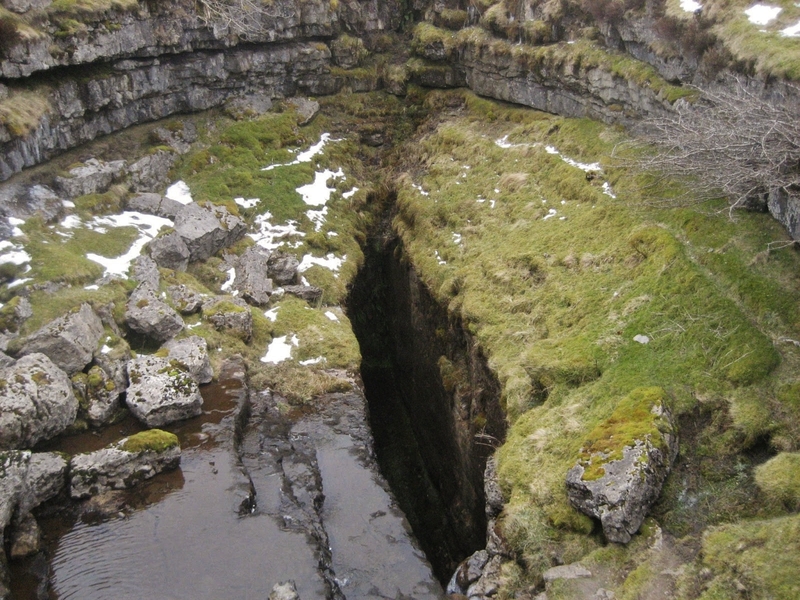 Often, potholes around Ingleborough are associated with dolines. They may form beneath soil cover (inside the typical shakeholes) causing material to sink into the fissure beneath – or they may be seen inside collapse dolines such as at Bar Pot. Many of the entrances are in youthful states and are very narrow and constricted, while others, such as Alum Pot are massively developed and of great age. The clusters of potholes surrounding Ingleborough are all associated with one or more major resurgences where they meet the basement rocks beneath. Those of the Allotment emerge at Austwick Beck Head in Crummackdale, while the Newby Moss Holes reach either Moses Well (Clapdale) or Clapham Beck Head; sometimes both. The latter is the resurgence for the entire Gaping Gill system. 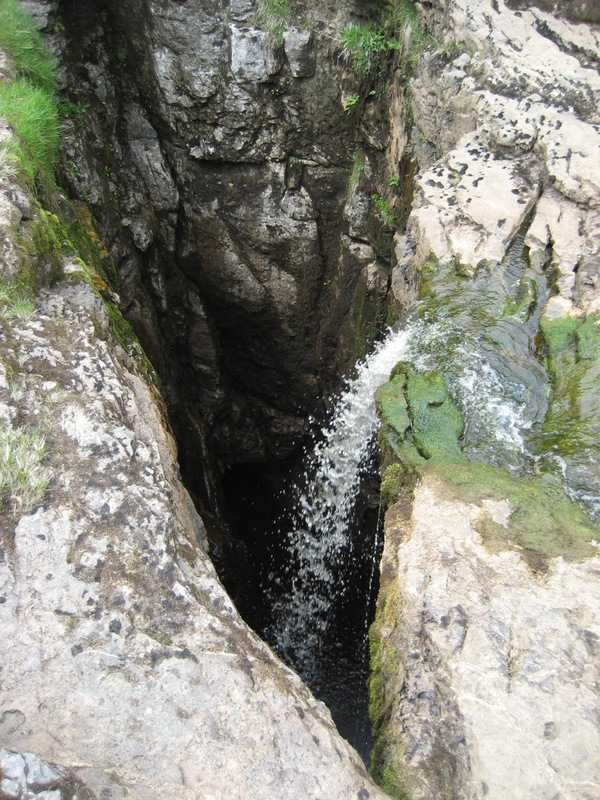 Most of the classic Chapel-le-Dale holes resurge at God’s Bridge, on the valley floor, before forming the River Doe on its way through Ingleton. Alum Pot has a complicated drainage that passes under the Ribble to emerge at the mysterious pool of Turn Dub, before being channelled back into the main river for its journey to the sea.